The Northwest Cup downhill race series comes to Whitefish August 26. Read more about the race and the series here. Select trails will be closed to the public on Saturday and Sunday. 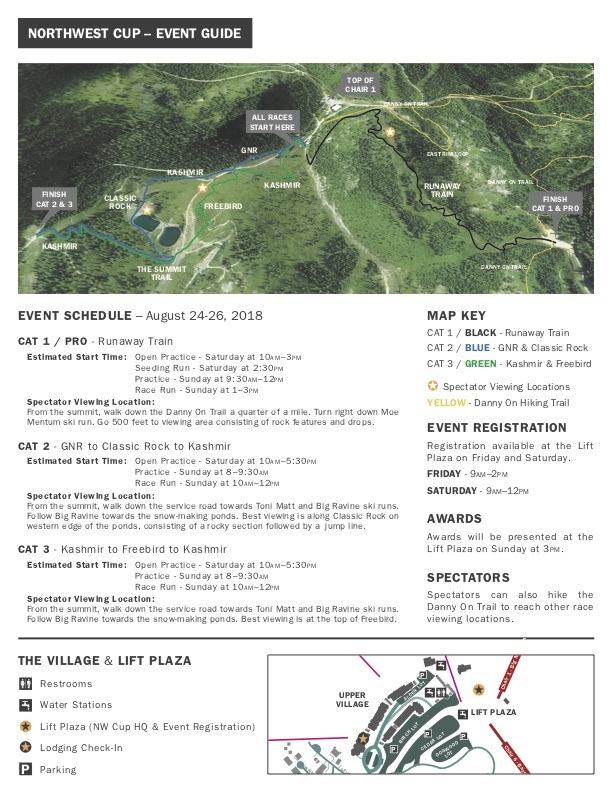 The Northwest Cup Downhill Race Series comes to Whitefish Mountain Resort for Summer 2018! You are welcome to view the race from alongside the race course. However, do not step within the race tape or walk along the bike trail at any time. Racers are moving fast and without much time between them. From the summit, walk down the Danny On trail ¼ mile. Turn right down ‘Moementum’ ski run, go about 500’ to viewing area consisting of rock features and drops. From the summit, walk down service road towards Toni Matt/Big Ravine ski runs. Follow Big Ravine towards the snowmaking ponds. Best viewing is along Classic Rock on the western edge of the ponds. Rocky section followed by a jump line. From the summit, walk down service road towards Toni Matt/Big Ravine ski runs. Follow Big Ravine towards the snowmaking ponds. Best viewing is at the top of Freebird.